A new catalyst could dramatically decrease the cost of producing hydrogen, one of the cleanest renewable fuels. Based on molybdenum sulfide, the catalyst was developed by a group at the A*STAR Institute of Materials Research and Engineering, led by Shi Jie Wang. The new catalyst could revolutionize industrial use of the hydrogen evolution reaction (HER), which generates hydrogen gas by splitting water molecules. The most efficient catalysts for HER use noble metals such as platinum, which are prohibitively expensive for large-scale production. Current global production of hydrogen is estimated at 50 million tonnes, but demand could take off if production costs can be reduced to make it competitive as a transport fuel. "We are intensively exploring catalysts made with Earth-abundant materials with HER performances comparable to noble metals," says Wang. The team's success came when they stumbled across a new crystalline form of molybdenum sulfide, with composition Mo6S4. The common structure, molybdenum disulfide (MoS2), initially showed promise as a catalyst, but was limited by the low efficiency of hydrogen adsorbing to the surface. The transfer of electrical charge—central to the catalysis process—also proved slow. Unexpectedly, researchers found MoS2 catalysis occurred most efficiently at the edges of the material or at flaws in the lattice where there were unpaired electrons. This led Wang and his team to attempt to introduce MoS2 flaws by varying the ratio of molybdenum to sulfur. At a particular ratio they were surprised to find that, instead of flawed MoS2, they had produced a regular two-dimensional crystal. Examining the structure with a scanning tunneling microscope, the team found a square lattice structure made of repeating units of Mo6S4—quite different from MoS2's hexagonal lattice structure. 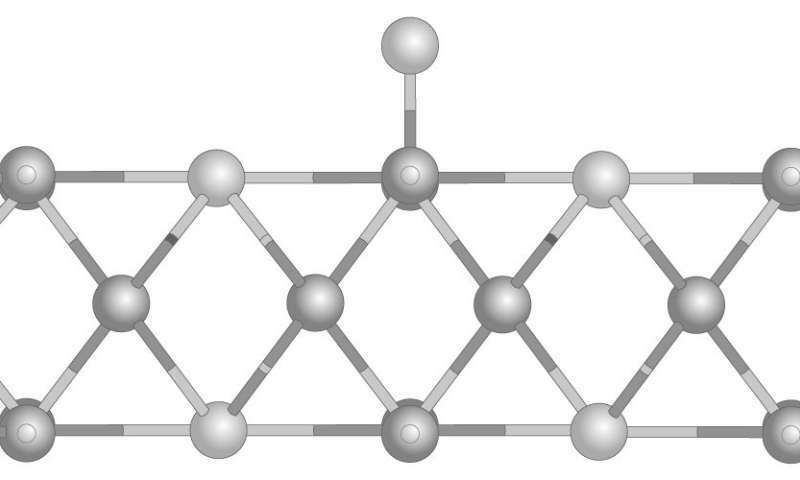 Modelling of the square structure suggested it would be an efficient catalyst, as its characteristics were closer to metals such as platinum than the semiconductor-like MoS2. Experiments confirmed the performance of Mo6S4: the voltage required to drive the HER reaction was about 0.1 volts, 50 per cent lower than flawed lattice MoS2, and approaching platinum (~0.05 volts). "It's not quite as good as platinum, but considering that it's very cheap and very stable, I think it has great potential," Wang said.